This is the cave entrance into the Chapel at the Jesuit Retreat House called the White House in St. Louis, MO. I have been attending a yearly silent retreat there for the past ten years. It's an awesome, spirit filled place. A place where the creature becomes the creator. 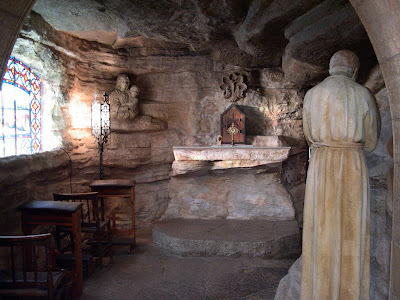 The cave is modeled after the cave in which St. Ignatius of Loyola, the founder of the Jesuits, wrote his Spiritual Exercises. These exercises are the basis for every retreat since that time. Will You Soften My Spirit?